I wonder if there is a connection here with health effects related to the switch from animal fats to vegetable oils in diet? Also, sounds like a cold adaptation? Did they ignore what has been discovered about the genetic origins of Europeans? The theory that Europeans are full blooded descendants of the first people to settle there was proven incorrect along time ago. What do they mean by Asian? east Asian, south Asian, west Asian, central Asian? The relationship between differnt people in Asia to Europeans varies. They are using out of date ways to classify modern people. "The theory that Europeans are full blooded descendants of the first people to settle there was proven incorrect along time ago." 1) If the people who lived in west Europe, east Europe and Siberia all picked up the same alleles then any reshuffling of the deck east to west would result in the same alleles being present. 2) Even if the shuffling was south to north if those alleles were particularly adaptive in the north then they could be selected for after admixture through selection in place. In might even be the case that those neanderthal genes entered modern human DNA somewhere else entirely and were selected against elsewhere and only spread in the north because they were particularly useful in north. Amerindians were not sampled, so the whole study is a wash. The map leaves a huge swath of crucial territory between between western europe north africa and japan unsampled. Including where where hybridization first occurred. Thousand genomes, doesn't check the South Asian ones for some reason. Logical? Asian in this context means East Asian, specifically NE Chinese, SE Chinese, and the Japanese. I don't really see a problem in grouping together related populations in this way, especially when dealing with archaic admixture, since the recent Vernot and Akey paper found low intra-regional differences in Neanderthal ancestry, but significant inter-regional differences. The trait discussed in this current paper is fairly consistent with that general pattern. While a wider range of samples is always a good thing, the similarity of relatively-more-HG and relatively-more-farmer Europeans to one another in Neanderthal ancestry seems to suggest that the HG/farmer distinction isn't particularly important in the W. Eurasian distribution of Neanderthal genes. Likewise, the three East Asian populations also certainly differ from one another ancestrally, but not in terms of Neanderthal ancestry. This could mean many things: maybe the current archaic genetic baseline in modern humans was reached before the ancestors of all populations within a region (i.e. Europe or East Asia) split from one another. Or it could mean that deselection of archaic material was so specific that it continued after their ancestors split, but reached the same endpoint in each population of a region, meither for environmental or genetic reasons (for example that Europeans lacked their own version of a gene that Neanderthals had, while perhaps East Asians had their own gene for this already, so the gene may have been similarly, but independently, selected by the ancestors of each modern European population). Could be. We know that early W. Eurasian-like populations were in Siberia during the last ice age, and the ancestors of East Asians seem to have been somewhere further south during this time (based on the fact that populations that meet usually mix, and MA-1 had no East Asian admixture). But it's hard to understand why relatively-more-neolithic Europeans have as much (and more, in the case of the IBS sample) of this trait as relatively-more-HG Europeans if it's purely a cold adaptation. BTW the African-ancestry brain tissue specimens were actually African American rather than Sub-Saharan, so one would expect a sizable Neanderthal admixture there too. Of course with so few fat tissue samples, the "greater biochemical diversity" conclusion might be a fluke too? "But it's hard to understand why relatively-more-neolithic Europeans have as much (and more, in the case of the IBS sample) of this trait as relatively-more-HG Europeans if it's purely a cold adaptation." It would make sense if it's a dietary adaptation though. Mesolithic hunters ate relatively more fish than Neolithic farmers did they not? 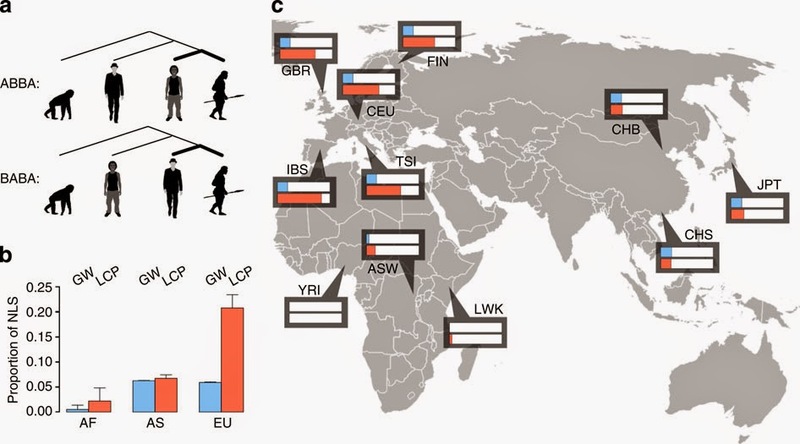 If (and it's a BIG if) East Eurasians followed a more coastal (or even just wetter) migration route, it would make sense that these traits would have conferred less of an advantage in East Eurasian than West Eurasia, wouldn't it? I wish there was a South Asian sample in the study to compare to. When I have been able to look up research on the function of specific genes mentioned in this kind of study, I have found that there has been very, very little research, and the function of those genes is largely unknown. Also, it sometimes turns out to be different than originally thought. So I wouldn't put any weight on these findings for that reason. Its true that jews have more neanderthal DNA than gentiles? I wish they'd say something about the human leukocyte antigen (HLA) system. At least there are some islands of knowledge in the sea of ignorance. Other hominids nothing more than animals that can walk erect and grunt a few syllables. Only Neanderthals were human. The rest were only simulacra made in the shape of people. They squatted in the mud with a place for sleeping and a fire and no sign of families or organised burial or any abstract reasoning. Sorry everybody else, reality is tough but that's what the evidence says. H erectus made necklaces with Tasmanian tigers teeth and a lot of the very early Australian settlement evidence is likely to be erectus. That potentially includes art. Probably a lot of the very early stuff in asia also. "Its true that jews have more neanderthal DNA than gentiles?" No. Most non-Africans have about the same amount. As I guessed above would be the case, there's no essential difference between the mesolithic and neolithic populations. I'm not sure the figures can be directly compared with Sankararaman et al. 's recent estimates of Neanderthal ancestry in modern populations, since different methods of estimation may have been employed. Lazaridis et al. seem to compare the ancient levels to a ~2% average in moderns, from which the ancient populations don't diverge (with the exception of both the Skoglund farmer and the Skoglund HG). "H erectus made necklaces with Tasmanian tigers teeth and a lot of the very early Australian settlement evidence is likely to be erectus". Not many would claim the early Australians as erectus. 'Modern' haplogroups have been found in them apart from a possible pre-sapiens mt-DNA in one of the Lake Mungo individuals. Some sites are just too old to reasonably be Sapiens IMO. Australian archaeology is such a mess, nothing can be retested, the Mungo site is deteriorating, and even if something new is found chances are we wont be allowed to look at it anyway. "Some sites are just too old to reasonably be Sapiens IMO". As far as I'm aware no site is undisputably older than around 50,000 years. Certainly nothing in Tasmania approaches even that date. "Australian archaeology is such a mess, nothing can be retested, the Mungo site is deteriorating, and even if something new is found chances are we wont be allowed to look at it anyway".